Hello, we are Knight Riders team 5115! 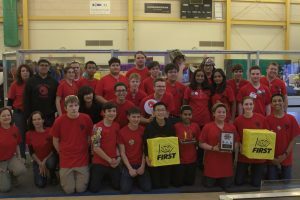 We are aFIRST Robotics Competition (FRC) team at Wheaton High School located in Silver Spring, Maryland. Our team was founded in 2013 and a few short years we have won three major district competitions consecutively. Every year, our team of 20-30 students build and design a robot that must fit into a set criteria including: an autonomous period, a set of operator commands, and a wide range of mechanical abilities. Our robot is student designed, student built, and student run. We participate in various competitive events challenging our STEM, communication, and management skills. Our team is split into four collaborative subteams, including, mechanical, electrical, programming, and strategy. We also have a team of mentors made up of professionals, parents, and our staff sponsor Mr. Scott, who aid us through our endeavors. We also have generous sponsors who provide the financial resources to develop, build, and test the robot, compete in tournaments, and introduce middle school students to robotics. Although we aim to be successful in our competitions, our main goal is to learn and evolve our skills, that will hopefully prepare students for careers outside of high school. Outside of competing we aim to spread community interest in the STEAM field, and encourage young people to focus on interest around engineering.